Some tips on how to activate a park. Consider the time of day for your activation. Is the band you intend to operate on, going to be open at that time ? Do not reply on Google maps. Not all Conservation Parks are shown. Sadly, do not rely on the DEWNR website. It is not accurate, nor complete. Before doing an activation, add an Alert to parksnpeaks. 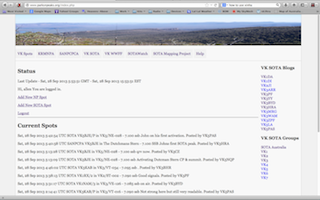 Before doing an activation, place a message on the VK5 Parks Yahoo group. The more people know that you are going to be in the park, the more contacts you are likely to end up with in your log. Check out the various Blogs/Wordpress sites of other activators. You can find a lot of very useful information there. Help Activators, by placing a spot on the DX Cluster. Use local repeaters to your advantage, to advertise that you are in a park. Send out e-mails prior to your activation, advising friends of your intended activation. The majority of VK5 Parks contacts so far have been made on 40m. A starting point (or a calling frequency) has been …..
On 40m, 7.090 mhz seems to have become the frequency of choice for SOTA activations, so lets try to leave that free for the SOTA activators. Please also give some strong consideration to activating other bands, e.g. 20m. There are lots of further afield operators who are keen on the award, and propagation on 40m does not always allow contact with those amateurs. Allen, VK3HRA, has created a superb spotting and alert program called parksnpeaks. The program also allows you to add a new VK alert of proposed activity. There is also a list of VK5 activator blogs; various VK groups websites e.g. VK5 Parks, KRMNPA; various links to interesting websites, & APRS locations for amateurs. So if you do intend to activate a VK5 park, then not only place your details on the VK5 Parks Yahoo group, but also place an Alert on parksnpeaks. It is a GREAT tool ! You can go to the site by clicking on the link below…. Feel free to download the 2nd edition of the 'Beginners Guide to SOTA, VK5 Parks, KRMNPA & WWFF'. View the excellent publication "South Australia's National Parks Guide".